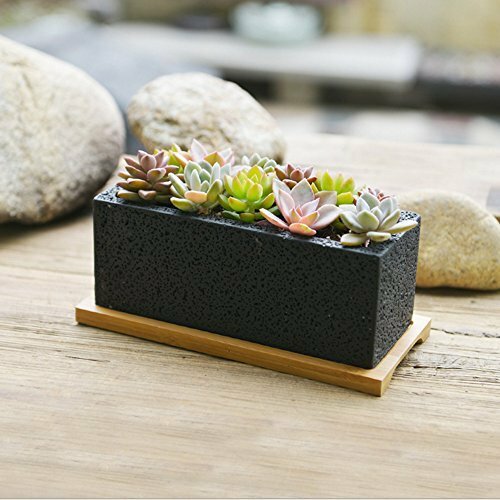 Nattol 8.5 Inch Rectangle Black Succulent Planter Pot with Bamboo Tray 1.Material: Cement and bamboo; 2.Approx. Dimensions: Overall - 8.5L x 3.7W x 3.4H inches; pot - 7.9L x 3.1W x 3H inches; bamboo saucer - 8.5L x 3.7W x 0.5H inches; 3.Package included: A set of modern design black rectangle cement pot with a removable bamboo saucer; 4.Application scenes: Ideal for holding your favorite plants, succulents, cactus and different decorative items or for your home and garden. If you have any questions about this product by Nattol, contact us by completing and submitting the form below. If you are looking for a specif part number, please include it with your message.